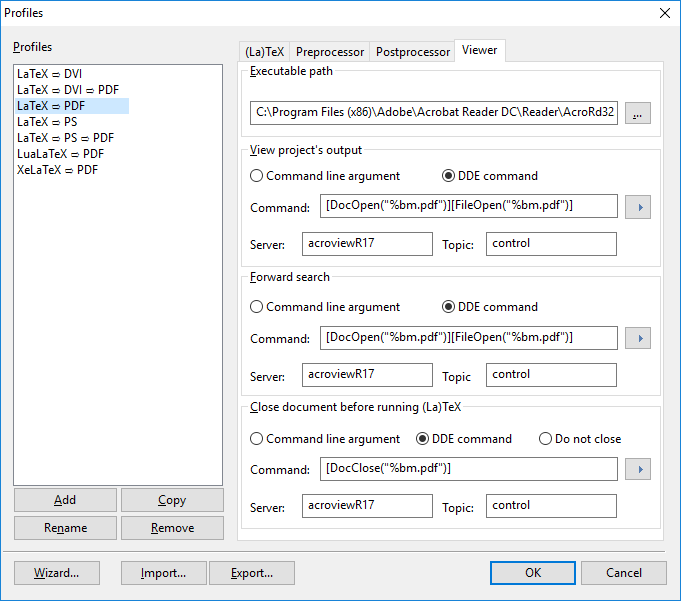 How to configure TeXnicCenter to work with Adobe Reader DC? When I building and view current file .tex the following error "Can not execute the command" shows up and the PDF is not generated. If there are any related post, could help. Thanks a lot! Go to menu: "Build"-> "Define Output Profiles." choose profile "LateX to PDF". Parameters: "Command", "Server" and "Topic" appears three-times on settings page - be sure to change ALL three appearence correctly. (For the earlier version of Adobe, it should be acroviewR15. For later versions of Adobe, it should be acroviewR18). After setting everything, confirm "Profiles" dialog and it is done. With the (silent) April 2017 update to Acrobat Reader DC to version 2017.009.20044, the parameters in Jiří's answer don't work anymore. TeXnicCenter just stops responding when trying to view the output with F5. To solve the problem, simply replace the server parameter from acroviewR15 to acroviewR17 like below. The dialog can be accessed with Alt + F7. Read more about the new Acrobat Reader version number here. To complement the answers by Jiří Chmelík and Frank Seifert. 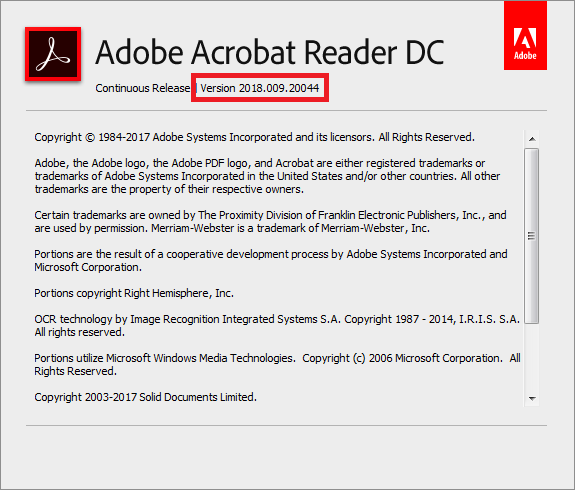 Update: In October 2018, Adobe Acrobat Reader DC has been updated to 2019.008.20071. acroviewR19 should be used instead, if you have this or a newer version. In November 2017, Adobe Acrobat Reader DC has been updated to 2018.009.20044. If you have this reader version (or any version starting with 2018), replace the server parameter from acroviewR15 or acroviewR17 to acroviewR18 as shown below. To access this dialogue box, press Alt+F7 in TeXnicCenter, select the "Latex => PDF" profile, then switch to the "Viewer" tab. 2015, set all your Server parameters to acroviewR15. Reference for all future versions of Adobe Acrobat Reader DC. 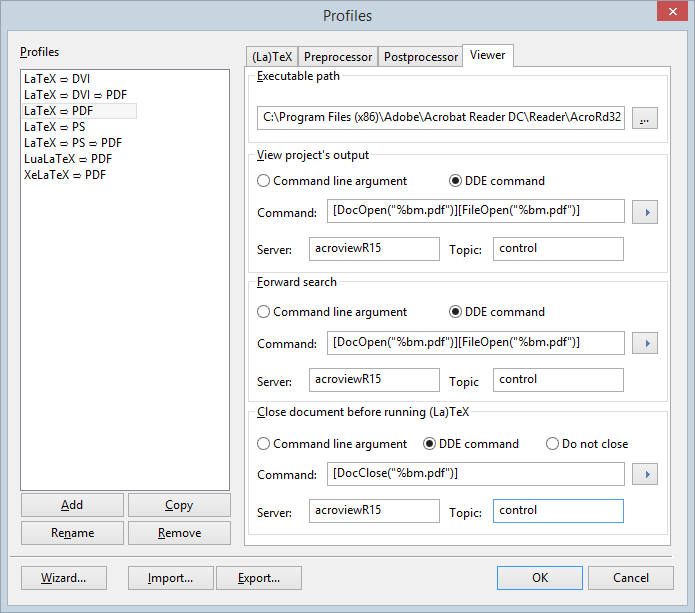 defined in Build -> Define Output Profiles... -> choose "LateX to PDF" -> Viewer tab (for TeXnicCenter). View project's output and Forward search: Choose Command line argument and type in "%bm.pdf"
The server above is for Adobe Reader. For Adobe Acrobat Pro, use arcroviewA11. Not the answer you're looking for? Browse other questions tagged pdf texniccenter adobe or ask your own question. How to view TeXnicCenter PDF output with Adobe Acrobat and Adobe Reader? Why isn't my pdf opening? Why is my TeXnicCenter not compiling and producing any output in PDF? Compilation of LaTex in Windows? With TeXnicCenter or other software? 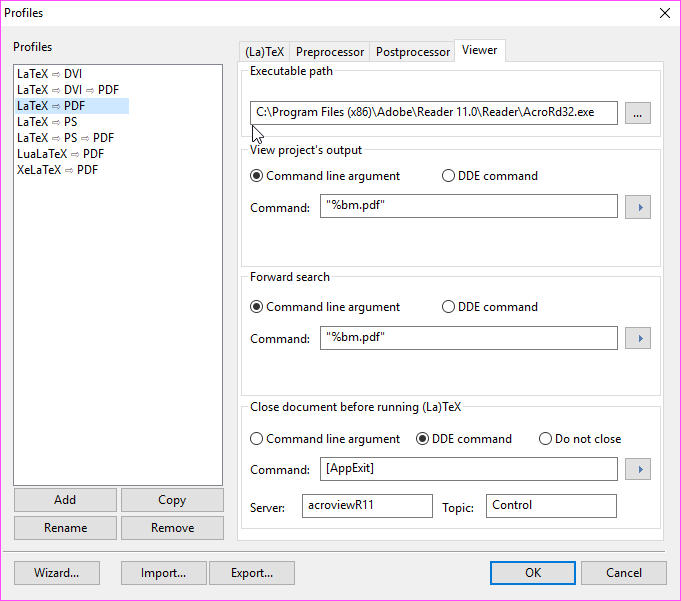 open pdf at current page using TeXnicCenter and Adobe Reader, or should I use another setup?